The keystone output of this project is Design at Home: Domestic Advice Books in Britain and the USA since 1945 (Routledge, New Directions in Cultural History, 2014). This book contributes to knowledge and understanding of lifecourse and lifestyle an analysis of domestic advice literature according to the lifecourse and as a mediating channel of lifestyles. It exemplifies my examination of text, narrative and image, represented also by my book Writing Design: Words and Objects (2012) which explores the translation of design into words and vice versa and by my leadership of the TVAD Research Group from 2009-2018. Advice discourses present a conundrum for historians, including design historians. Published advice has either been disregarded as inferior to unpublished sources such as letters or diaries or it has been misused as evidence of lived historical practice. Neither approach extracts the optimum value from advice sources as historical evidence. Building on this insight, my major project, Designing Domesticity, contributes an original and highly innovative interdisciplinary method for the use of didactic discourses (advice books) in the writing of design and cultural history. I posit a new genre, domestic design advice, which brings together etiquette, homemaking and home decoration books. These three categories of published writing on the home complement one another as collectively they concern the social home and the material home, the fabric of the domestic space and the behaviours conducted within it. Domestic design advice is best read as a genre of real ideals, that is, combinations of image and text which collectively inform the way people designed, decorative and lived in their homes, or the way that they wanted to do so. Domestic design advice has been consumed in its own right, as a source of pleasure or entertainment aside from its application in real homes. Designing Domesticity demonstrates how close reading using techniques of literary analysis can reveal the biases of domestic design advice along lines of class, gender and age. Advice which purports to assist a newly expanded middle class, women working unaided in the home, and teenagers seeking independence is shown under analysis to serve hegemonic forces based on economic advantage, gender and seniority. ‘Hospitality and home, 1920-2000+’ in A Cultural History of the Home in the Modern Age (1920-2000+), ed. D. Stratigakos, Volume 6 in A Cultural History of the Home, ed. A. Flather. London: Bloomsbury Academic, 2019. ‘A Special Relationship: The Transatlantic Domestic Dialogue,’ Designing Worlds: National Design Histories in an Age of Globalization, ed. G. Lees-Maffei and K. Fallan, 188-210. New York & Oxford: Berghahn, 2016, 2018. ‘Small Change? Emily Post’s Etiquette,’ in Must Read: Rediscovering American Bestsellers, ed. S. Churchwell and T. Ruys-Smith, 217-248. London: Continuum, 2012. ‘Dressing the Part(y): 1950s Domestic Advice Books and the Studied Performance of Informal Domesticity in the UK and the US,’ in Performance, Fashion and the Modern Interior, ed. F. Fisher, T. Keeble, P. Lara-Betancourt & B. Martin, 183-196. Oxford: Berg, 2011. A blog post ‘From National Histories of Advice Discourses to a “Transatlantic Domestic Dialogue”’ Society for the History of Women in the Americas (SHAW) series on the British Association of American Studies (BAAS) website (2015). And an online image gallery for the Arts and Humanities Research Council (AHRC), ‘Designing Domesticity: Visual Techniques in Post-WW2 Domestic Advice Books’ (2014). 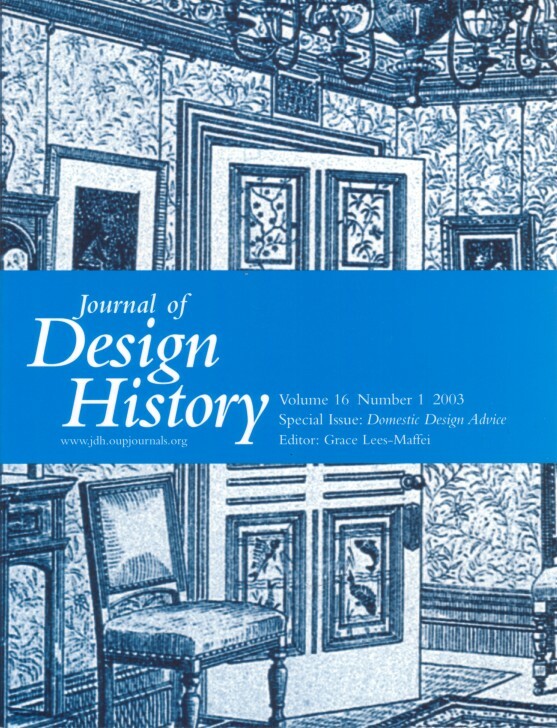 The Design History Society’s 25th Anniversary Research Award.